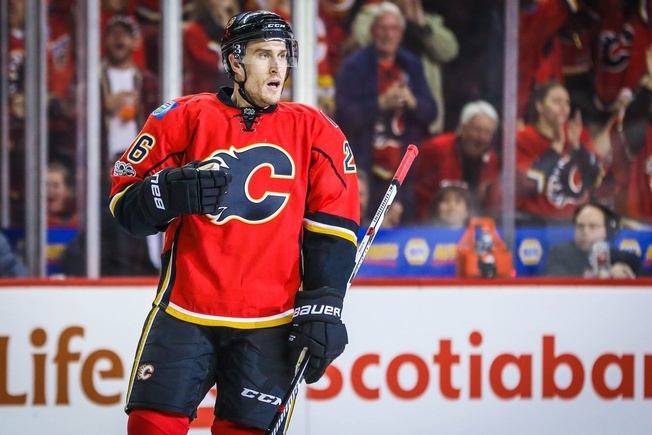 The Calgary Flames have been among the busiest teams in the NHL as of late and on Friday they continued their furious ways by inking defenceman Michael Stone to a three-year contract extension. The deal is worth a reported $10.5 million. The 27-year-old was set to become an unrestricted free agent on July 1. Calgary acquired his services in a trade with the Arizona Coyotes ahead of the trade deadline. The contract is a little on the steep side, but Flames general manager Brad Treliving hasn’t been shy about throwing money around. Of course, he’s also made economical moves. The acquisition of goalies Mike Smith and Eddie Lack came with Treliving arranging for their former clubs to eat part of their salaries. The Coyotes are retaining a quarter of Smith’s salary, while the Hurricanes are covering half of Lack’s coin. That’s not a bad arrangement for a brand new goalie tandem. But Treliving also parted with next year’s first and second round draft picks. He acquired defenceman Travis Hamonic and re-signed Kris Versteeg, sure, but some are wondering if the prices were too steep. What’s more, Treliving’s probably not done. Calgary also waived defenceman Ryan Murphy and winger Lance Bouma on Friday and intend on buying out each contract. What remains, then, is a pretty hot group of defencemen for the Flames. Hamonic, Stone, T.J. Brodie, Dougie Hamilton, and captain Mark Giordano comprise a group few teams will want to mess with. But Treliving isn’t quite set to plan the parade just yet.